Long overdue. Should’ve happened with the last go-round. Hope it goes through. In all fairness, he (Darius) was with BC before he was with Edmonton. Both the CFL and CFLPA are in favour of reducing the number of national starters from seven to five after the issue was raised during recent labour negotiations in Toronto, per sources. While a final decision has yet to be made, there appears to be a consensus on this issue after the first round of negotiations. Currently, seven of the 24 starters on offence and defence must be nationals, part of the 21 non-imports on the 44-man game day roster. But those numbers might change at the bargaining table. My thoughts - while I want to see the Canadian content remain strong in our league, things are changing. The best Canadians are trying to play south of the border, and with a potential tenth team in the CFL, that puts a strain on talent even further. My personal thought is that I'd like to see them change the rule from seven starters to three Canadians on the field at all times. This would ensure 25% Canadian content on the field at all times and be much easier for teams to track when making roster adjustments on the fly. The issue however is if a rule change like they are proposing (or even mine) is implemented, they will have to adjust the overall roster as well. You can't have 21 Nationals representing only 5 starter positions. I would have normally been opposed to this but with the number of Canadians getting jobs in the NFL and an additional franchise it is going to get to be a problem so I guess I'm OK with it. Am surprised that the Canadian contingent in the CFLPA were willing to entertain this notion in negotiations. I'm assuming that they will be wanting something from the league in exchange as I see this as a concession on the players side since it will probably result in a lower overall team salary as starting Canadians tend to be more expensive than starting Americans (outside of the QB position) all other things being equal. If they do change the ratio, I don’t think it should be 5. 6 is fair to all 🤷🏽*♂️ #CFL #CFLPA I say that because like they say, it is the Canadian Football League. We can’t just take over their game. They doing us a favor by giving us an opportunity in their country. If they do change the ratio, I don’t think it should be 5. 6 is fair to all ����*♂️ #CFL #CFLPA I say that because like they say, it is the Canadian Football League. We can’t just take over their game. They doing us a favor by giving us an opportunity in their country. Good time to be a fly on the wall with the ongoing talks. Ambrosie also asking for two global players to be on a CFL roster. Maybe not much change coming this season but looks like some change to quotas seems to be inevitable. Hopefully we take a cautious approach though. The CFL is never going to be a big ticket item in Europe as the NFL found out when they tried and an NFL team in Mexico seems to be a big draw but the CFL ??? including 1 player from a country that ends in vania or slavia so Transylvania, Bratislavia or Vulcavania. Isn't it your lifelong dream to be a football scout in Transylvania? There is certainly a narrative out there that this was information leaked to Dunk in order to sew division and test the solidarity between Canadian and American players. If that is the case or was the plan, there were certainly some that took the bait and stated their opinions on social media. Ramsay's four-part tweet certainly seems to imply that the story was not an accurate characterization. It is kind of a challenge to believe that the CFLPA's initial proposal would include something that rings as a concession. That's not to say that they wouldn't be open to something, but to lead with it as an ask, rather than hold it as a bargaining chip just seems off. I believe Dunk to be fully credible as a reporter, and obviously, he has as good sources as anyone around. I believe that he accurately portrayed what was told to him, and am not attributing any agenda to him. If there is something to it, I would suggest it is likely at the source level. Agree. Based on some of the twitter conversation the past few days, there appear to be a number of INT CFL players that have implied that the mood with many in the union is similar to what Dunk is suggesting. You would have to believe that such a "mood" has translated into informal initial discussions at the negotiation table. I personally trust Dunk more than any other CFL reporter out there. He has his sources for a reason. Do you think any of them would be good enough to start or are we talking special teamers to begin with? Last edited by adb; 03-18-2019 at 02:02 PM. Of course you have your andrew harris etc which as are good as any American .. but there is def the talent in Europe to fill 2 spots and contribute without question! ^ You're probably a little biased, aren't you? Seriously though, it'd be cool to see more Germans / Brazilians / Portuguese in the CFL. Sometimes wording can be tricky and it looks like the PA is using very specific wording here... Brian didn't say that they haven't discussed reducing the ratio, he also didn't say that the CFL and the PA haven't come to an understanding in principal about reducing the ratio, he said that nothing has been "agreed to" and "we have not reached an agreement". Of course nothing has been "agreed to", and nothing will be "agreed to" until the entire CBA is signed. So while his comments may initially appear to be an outright denial that the ratio is going to change, he hasn't really said that at all. Don't know if he is considered a # 1 pick but someone was telling me that UBC D lineman Connor Griffith is a good one. Last edited by cmbuk; 03-19-2019 at 02:41 PM. I never read it as an outright denial that the ratio is going to change - you're right, he never said that. I read it that the media report (presumably Dunk's) overstated the agreement (as in the common ground meaning of the word) where both parties were open to changing the ratio. An experienced labour negotiator like Ken Georgetti is not going to put forth that sort of "concession" this early in the process, even if the CFLPA was interested in it, just due to its value as a trading card. You're absolutely correct though - that statement is carefully chosen to deny specific things without denying the entire subject is open for discussion. To a degree, it underlines my point above - if they're being that carefully advised about statements on Twitter, they're not coming to the table as amateurs when it comes to bargaining. TORONTO – The CFL Combine presented by New Era is about to have another layer of training and testing added to its circuit. The CFL revealed Thursday that Wilson Sporting Goods will implement the Wilson X-Pro Connected Football and Training System as a way to capture data on the quarterbacks participating in the Combine. 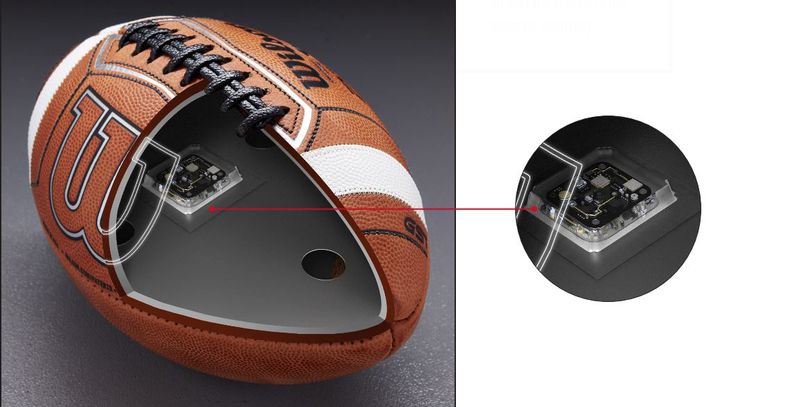 The technology will utilize an undetectable sensor embedded in a Wilson CFL football to measure quarterback performance in the areas of throw quality and play timing. “Any time we can work with our partners and provide teams with more tools to evaluate prospects with evolving technology we will take that step like we have with the Wilson X-Pro,” said the CFL’s Senior Director of Football Operations, Ryan Janzen. Maybe that chip could find the goal line. That's what I've been thinking. I don't think it'd be that hard to use a chip to place the ball more accurately. Let's just not let Boeing design it. About time IMO. I also really like giving the coach 2 challenges with the coach only retaining the 2nd challenge as long as he wins the first one. I actually like all of the recommendations mentioned in the article and hope they get implemented. Last edited by adb; 03-22-2019 at 01:32 PM. Proposed Rule Changes for people who don't want to read the article. • the ability for the command centre to upgrade a 15-yard roughing the passer penalty to a 25-yard infraction for a direct blow to the quarterback’s head or neck with the helmet when the player has a clear view to the quarterback without mitigating circumstances such as the pivot ducking their head. • the command centre assisting referees with called and non-called roughing the passer penalties including instances where an obvious roughing the passer penalty was not called because a referee’s view was blocked. • whistling a play dead anytime a quarterback carrying the ball gives himself up by sliding with any part of his body. Currently, a quarterback can only give himself up by sliding feet first. Making it illegal for a defensive player to deliver a forcible blow to the long snapper while the snapper’s head is down and he is in a vulnerable position and unable to protect himself. Not many surprises here. The only thing that I do not like is there is no exception if the QB ducks his head intentionally. Don't get me wrong I am all about player safety, but there has to be some limits. If the QB intentionally drops their head what is the defender supposed to do? I am seeing a flag fest for at least the first half of the season. The only other one might be a problem is the contacting the kicker call if the defender touches the ball. It would make the defender take a better angle so it does not happen though. The only thing that I do not like is there is no exception if the QB ducks his head intentionally. when the player has a clear view to the quarterback without mitigating circumstances such as the pivot ducking their head. In the complete set of rules change recommendations there was reference it still being roughing the passer (15 yards) if ducking. The exception for ducking is only in place where they could upgrade it to 25 yards instead of 15. Nevermind, I was going from memory of Dave Campbell's tweets and he misquoted that part. Nothing appears to be in the CFLs article. Last edited by bone; 03-22-2019 at 02:29 PM.